It must be very tempting for a prolific academic to write the same book many times. This is not a cynical comment, though each iteration wins the department more research points. Rather, research deepens knowledge, conferences demand new ‘chapters,' it is a natural human trait to think ‘I could have done it better.' It is rarer to be a Simon Schama and tell many stories, related only in their fine narrative interest, than to be a Geoffrey Elton's studied by every schoolboy, who wrote a dozen books on Tudor England with the same premise. How should we rate Peter Williams? As a Bach scholar, his only living rival is Christoph Wolff. Musicians have much cause to be grateful for Williams' many books and articles, which include a complete, detailed survey of the organ music (revised on republication), a book on the Goldbergs, a biography concentrating on the life, not the music, and so on. And now, a Life in the music. Do we need it? The short answer is no, the long one yes. 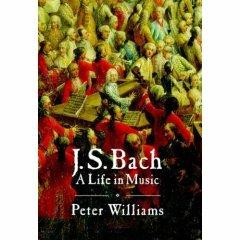 The ‘originality' of Williams' presentation is to use Bach's official obituary as a starting point, and to try and make that comprehensible to a modern reader. But a general reader, trying to make sense out of a mass of detail, will likely find this a bit of a gimmick. Much as Wolff's standard biography is pretty indigestible, one longs for the straightforward black and white story of ‘Amadeus, 'however threadbare that may be historically. But not so fast. The whole point of Baroque research in general and Bach scholarship in particular is that the controversies are not straightforward. Manuscript sources, performance practice, cultural contexts and intellectual intentions are all debated with enormous banks of evidence, but little prospect of certainty. What emerges as the special point of this book is a mass of detailed insights on the music that can only come about from a lifetime of living with that music. The vividness of the Crucifixion in the Passions? – Bach's contractual requirement to attend public executions gave him experience of such events. Why are the English Suites musically difficult pieces? Because Bach was trying so hard to write counterpoint into the forms he had picked up. Referring to Williams has informed each of my recent Baroque reviews. For instance, everyone knows that Buxtehude influenced Bach. And everyone knows Bach often had disputes with the elders of the various churches where he worked. But how, and why? Organ music in Bach's part of Germany was simple in construction. So Bach was ravished by Buxtehude's variety. In turn, Bach transformed this by turning such varied sections into complete movements with different characteristics. His less sophisticated congregations could not grasp so much innovation and complained. Life and Music illuminate each other. Bach famously said that his achievements were all due to hard work; if you work as hard as me, you can achieve as much . Whether or not this is simply an extreme expression of the Protestant work ethic, there is no doubt, those who study Bach have to take infinite pains too. Interestingly, the ‘feel for the subject' that any scholar with deep knowledge acquires strays into the domain of reasoned intuition that we call criticism. In the end, all students have to have a certain degree of trust in the master's judgment. Williams also writes well, though this is far from an easy read. But if one now wanted to recommend just one book on Bach, this would be it.